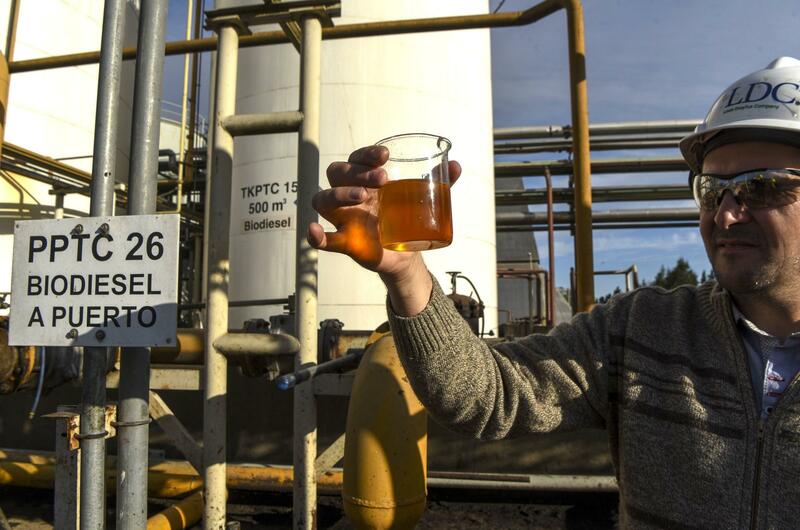 An engineer shows a sample of biodiesel at an industrial complex in General Lagos, Santa Fe province, Argentina. The United States recently imposed duties on Argentine biodiesel, blocking it from the U.S. market. And the most wasteful part of the RFS, according to some, is biodiesel. It's different from ethanol, a fuel that's made from corn and mixed into gasoline, also as required by the RFS. In fact, gasoline companies probably would use ethanol even if there were no law requiring it, because ethanol is a useful fuel additive — at least up to a point. That's not true of biodiesel. "This is an easy one, economically. Biodiesel is very expensive, relative to petroleum diesel," says Scott Irwin, an economist at the University of Illinois, who follows biofuel markets closely. He calculates that the extra cost for biodiesel comes to about $1.80 per gallon right now, meaning that the biofuel law is costing Americans about $5.4 billion a year. Irwin explains that use of biodiesel is driven by three different parts of the Renewable Fuel Standard. The law includes a quota for biodiesel use, but in addition to that, biodiesel also is used in order to meet the law's demand for "advanced biofuels." Finally, there's an overall quota for biofuels of all sorts, and companies are using biodiesel to meet that quota as well because they've run into limits on their ability to blend ethanol into gasoline. Defenders of biodiesel insist that it's a much cleaner fuel than regular diesel, because it doesn't come from the ground, but from plants — mainly soybeans — that capture carbon dioxide from the air as they grow. In fact, by the EPA's calculations, replacing petroleum-based fuel with biodiesel will cut greenhouse emissions at least in half. Two environmental groups — ActionAid USA and Mighty Earth — just released a report connecting America's biodiesel demands directly to deforestation in Argentina. Investigators from the two groups documented widespread clearing of Argentine forests in order to expand cultivation of soybeans. Simultaneously, Argentina expanded its exports of soybean-derived biodiesel to the United States. In 2016, in fact, Argentina shipped more than 400 million gallons of biodiesel to the U.S., equivalent to almost 15 percent of all the biodiesel that Americans consumed. In addition, the most powerful factor driving demand for soybeans these days is China's appetite for soy meal, to feed its pigs and chickens, rather than America's need for soy oil to make fuel. "The big story is China's demand," says Irwin of the University of Illinois. "If anything is related to tearing up pastures in Argentina to grow soybeans, it's China and not biodiesel."